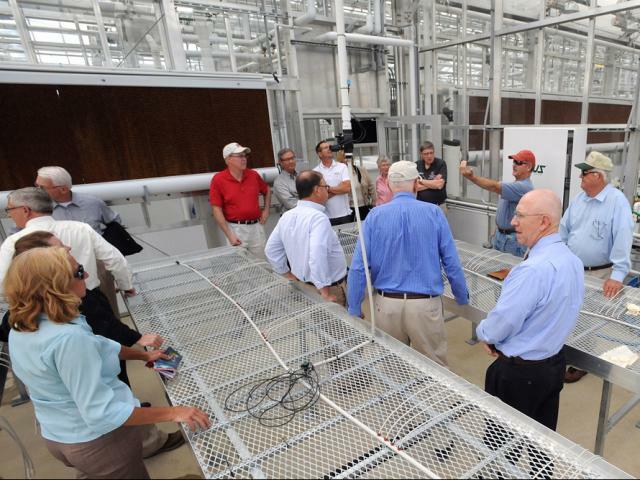 In the picture at the right, OARDC Advisory Committee members visit the center’s new Williams Hall greenhouses on June 9 in Wooster. In all, 10 committee members — Joe Needham, The Andersons Inc.; Bill Lawhon Jr., White Oak Farms; Kathy Davis, Ayers Farms; Tom Fontana, Ohio Soybean Council; Leah Miller, Small Farm Institute; Doug Billman, Twinbill Registered Jerseys; Justin Marotta, Possum Run Greenhouse; John Foltz, U.S. Department of Agriculture; Lisa Schacht, Schacht Family Farm; and Bob Joseph, OARDC — and guest John Foltz, dean of the University of Idaho’s College of Agricultural and Life Sciences, met on OARDC’s campus that day. They also toured the new Food, Agricultural and Biological Engineering Building, built to replace the building lost to 2010’s Wooster tornado. We appreciate their interest and support.